I suppose that a few people here remember and watched Princess Diana’s funeral. And, I suppose a few people remember and watched Mother Theresa’s funeral. I did and I was struck by the contrast in these two women who both captured the world stage. 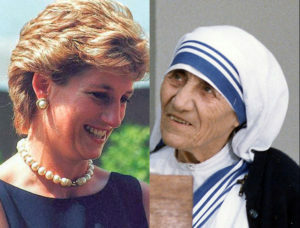 Princess Diana, was what most of us are really like, we are concerned about the poor, the needy. And, occasionally we do good things, but then we go on with our lives, pretty good lives. but nevertheless, accepted the gospel on it’s simplest, most childlike terms. She could see only the poor in the world, while the rest of us barely see them at all. but who was absolutely taken with Mother Theresa. He said something which I have thought about a lot. to be rich, to meet the rock stars of the century, to go anywhere and do anything. And we can’t. None of us will ever be a prince or a princess. Any one of us can give away everything we have and care for the poor. Anyone of us can have the life of the better of these two women and we don’t choose it. The more I think about what he said, the more I get stuck there. It’s true. We could all, each one of us, me included, have the life of Mother Theresa. Very few among us choose it. We would much rather hanker after Princess Diana’s life. She came to herself–to the simplicity of responding to the gospel late in life. and see simply and directly a new way to live.